Great tips and something that can't be mentioned enough. I've had quite a few kids come up and ask me and I'm always so impressed when they do. The other day a little kid ran up to Jack and he barked at him. I felt bad for the kid and I apologised to the father but he was so great and said it wasn't our fault and reminded his kid to always ask before trying to pet a dog. Thanks Hindy, I think so too. It's so important to remind parents, dog owners, and kids. I love your story! What a smart Dad to realize that his child should have asked before bounding over to your dog. I get that a lot too. You have to remind kids often, in their excitement they can forget! These are great tips. Hmm if I had to add any tips I would just say kids (or anyone) should never abuse or throw things at dogs (or animals). Not only is it abuse, an animal will react to what behavior it's given. Some people can be so cruel and try to do anything to harm an animal yet expect no reaction. Great post. Will share. Thanks Kamira. You're right, throwing things at dogs or behaving badly can cause a very negative reaction. Kids will sometimes throw things at a dog - not meaning to harm them, they just like to throw stuff! It's an important reminder. Fantastic post as it is so important to train the parents on the do's and don'ts to prevent bites from happening as in the end the dog pays the price with his/her life. Our dog park has a kid's section so there are lots of kids going through but the parents are amazing with teaching their kids what to do so I do not know of any incident in the 6 plus years I have been going there. Thanks so much Ruth, I appreciate that! 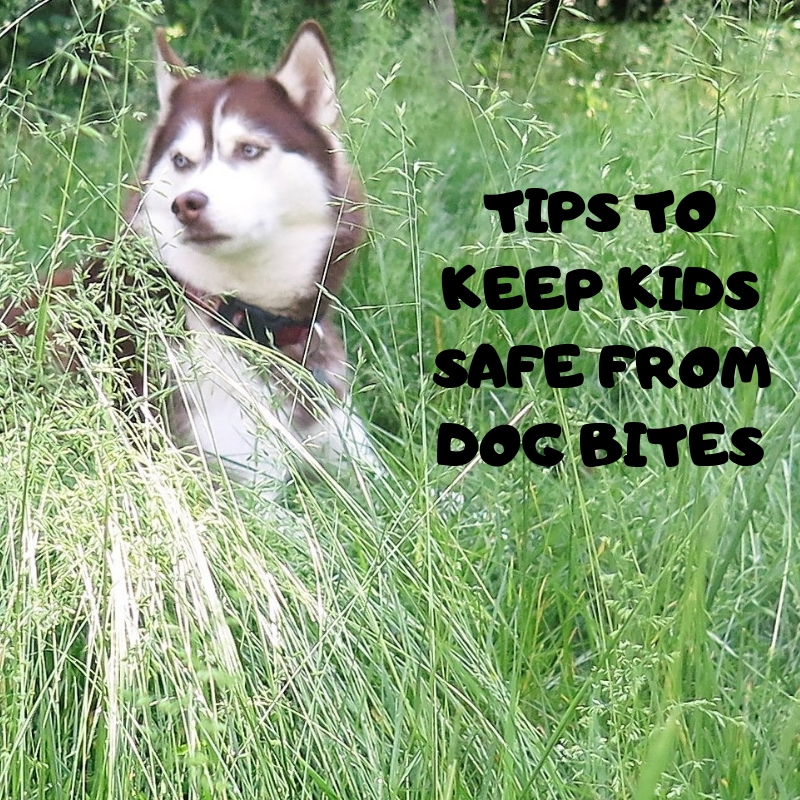 It is very important to teach kids how to approach and interact properly w/ dogs. And you're right, one wrong move on the part of the dog can cost them their life!! Even if it's just a warning snap, they could be picked up by animal control and end up being euthanized just for, in their minds, protecting themselves. It's unfair. This is sooo important!! I’ve seen some bad interactions in public when kids run up to dogs in stores or the beach. While I agree that perhaps a store isn’t a great place to bring an aggressive dog even a normally friendly dog can freak out when accosted by a loud face-level kid with no sense of personal space. I agree completely Holly! Super friendly dogs can feel threatened and trapped. They will protect themselves out of fear in the only way they know how - growling, snapping, and if it continues they just might bite someone. Parents need to make sure their kids know how to approach safely (& ask first!) and interact appropriately. Majority of kids really receive no education whatsoever about how to understand and interact with dogs. Considering how many dogs share their lives with us all, that is really sad. It should be top of mind for every parent to teach their kids about strange dogs, and never to approach without asking first and how to behave appropriately. It is sad that some parents are just clueless. Wow - I had no idea that the number of dog bites was so high! Dogs give us a lot of hints to stay away, but often we see them played out in videos as funny. It's really good that you wrote about this - it's a great piece to keep in my back pocket and share with readers! I know, isn't that crazy!? I was shocked too - I had to check several resources to be sure it was a real number. It's so scary. Dogs definitely give cues but too many people don't know how to read them at all, that's where the trouble can start. Thank you so much for wanting to keep and share my piece - I'm so flattered! I think that parental awareness has increased greatly in the last 20 years. Kids always ask me if they can pet my dogs instead of just running up to them and petting the dogs. I let them pet Nelly and Sophie, but just explain that Theo is a little on the grumpy side, and people accept that. I think the most important tip is never leave dogs and kids unsupervised, until you're positive that both know how to treat each other. I'm so glad you've encountered educated parents & kids. I have encountered many that are, but quite a lot that are not. I'm around kids w/ Icy a lot since she's a therapy dog. I always have to be alert and watch the kids interacting with her. There are always a couple of kids who need some guidance on how to approach & interact with her. You're right about always supervising kids and dogs at all times, that's so important! I don't have any tips, what I want to know is how to cope with the arrival of a large dog that I don't know. A big dog looks fierce and frightening no matter how 'friendly' the owner thinks it is. Parents need to be told their children need to be careful around dogs. Kids have no sense of danger at all. Yes, large dogs can be frightening when you don't know them at all. If they're off leash it's much worse! It's true many kids have no sense of danger until an incident occurs with a dog, then they become fearful of dogs, which is a shame. When a large dog you don't know comes around, ask the owner to put the dog into a Sit. Ask if the dog is friendly and if & how you should pet the dog. I often stay away from off leash dogs in public places. I assume the owners are irresponsible and the dog may not be well behaved or safe to interact with - the exception is in a designated Dog Park. Excellent post, Cathy! Just yesterday, a neighborhood boy came over when he saw my grandson and rushed up to my front door, peered in, and put his hand on my door handle to open my door while saying, "You have a dog?" I quickly replied, yes, and do not open my door! How would he even know what kind of dog - friendly or guard - was waiting in my house? And..his mother guardian was right across the street and let it happen! Today, we have to be so careful and really educate others (we sure do) about dog bites and prevention. Apparently, even at our own homes! This should be printed and given as a handout! Sharing! Thanks Dorothy! I'm so glad you think so. OMG, I can't believe the neighbor boy just wanted to open you door and come in knowing there were dogs inside. That can be a dangerous thing to do, dog or no dog. His parent should have taught him how inappropriate and potentially unsafe it is to open someone else's door and walk in! One day that could en badly for him. Excellent post! Since I am babysitting the grands, I am constantly aware of where Paisley (their Lab) is and tell the 3 year old the proper way to treat her. The 7 month old just started crawling and makes a beeline for Paisley. She is such a wonderful family dog and loves the girls but I'm still careful. Thanks Melissa, I'm so glad you liked it! I'm not surprised you are so careful with the little ones around the dog(s). That's the smart thing to do. Little kids should never be left alone with dogs, an adult should always supervise.